As the largest, richest, and most diverse city in the world, New Angeles is a shining beacon of human achievement and advancement. But such success also makes the city a fertile breeding ground for powerful megacorporations, each striving to best the others by flexing their economic and political muscle. The battle between these giants often tramples those less fortunate underneath them. The city is thus a playground for the privileged and powerful, resting on a foundation of poverty and pollution. New Angeles is a game in which four to six player assume the roles of megacorporations set in the Android universe. 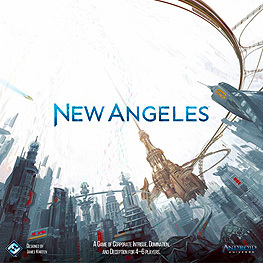 Players cut deals and forge temporary alliances to gain leverage and financial superiority over their corporate rivals, all the while trying to maintain order and profitability in the thriving megalopolis of New Angeles.